Is Khloé Kardashian wearing an engagement ring or just a Kardashian ring? 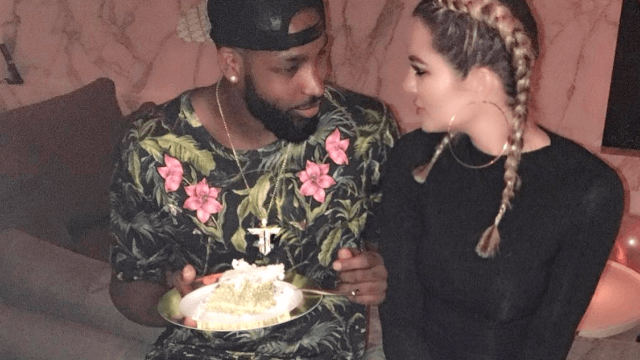 Khloé Kardashian threw her boyfriend Tristan Thomas a big birthday party Wednesday night. She shared some photos and videos from the event on social media, and... oh! What's that? A giant sparkly ring on Khloé Kardashian's finger?! Many people are of course speculating that the huge, glittering rock on Khloé's finger may mean that she and Tristan Thomas are engaged. However, we should keep in mind that Khloé is a Kardashian, and the big, sparkly ring could just be a part of her everyday wardrobe. She posted a video to Snapchat that captures the ring close-up. Are wedding bells in the air for Khloé Kardashian? Or is this just one of the big sparkly rings she keeps on hand (HA!) for casual wear? Only time will tell.